Are you checking people off the list? Struggling to figure out what to get the busy mom of littles on your list? Mommas with young kids often put herself last, struggle to find time for herself, and need a reminder to make herself a priority. 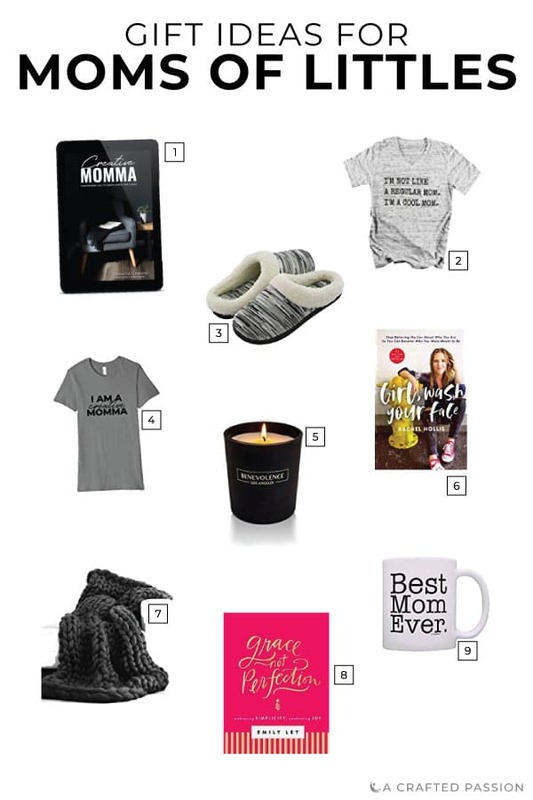 Check out these gift ideas for busy moms and dad’s…use this gift guide to help kids figure out what to get mom for Christmas. Creative Momma — Struggling to find time for herself? Creative Momma is written specifically for moms of little kids to empower her to create amidst the chaos with practical tips and advice. Thankfully it’s a quick read so any momma can find time to read through it. “I am a creative momma” shirt — This shirt is the perfect reminder to go along with the Creative Momma book to make herself a priority. Candle — A great way to hide the remnants of that dirty diaper that you forgot to put in the diaper pail upstairs or the cooking onions on the stove. Mug — Early mornings are a little better when you’re waking up with coffee in this mug. Chunky blanket — When this chunky blanket is screaming your name from the couch, it might just be the perfect reminder to take a little mental break and snuggle with the kiddos under the blanket while you watch an episode of Daniel Tiger. Slippers — Late night rocking the baby or early mornings with a toddler, slippers are a necessity. Grace Not Perfection — Nobody is perfect. We live in an imperfect world. Every momma needs the reminder of this and this book gives great tips and practical advice to give herself grace, not always pushing for perfection. “I’m a cool mom” shirt — Having a rough day? Give this shirt as a gift to remind every momma they’re awesome and, although it may not be the popular thing, one day they might be the Lorelai and Rory’s of the world that everyone looks up to. Girl, Wash Your Face — Unless you’ve been living under a rock then I’m sure you know who Rachel Hollis is by now. Every mom…let me say that again…EVERY. SINGLE. MOM. needs to read this book. It’s been on the New York Time’s Bestseller list for 31 weeks so far this year for a reason. If the busy mom you know doesn’t find time to read, no problem, the audiobook is better than the actual physical copy because it’s read by Rachel and I liked it better actually.